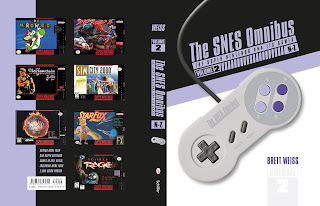 Advance reviews of The SNES Omnibus: The Super Nintendo and Its Games (N-Z)! Sample pages should show up on Amazon soon. The book is due April 28. "It's refreshing and inspiring to see a work as comprehensive as The SNES Omnibus. Any enthusiast of the age can relive dozens of hours of enjoyment simply by scanning the pages and hundreds more by digging into its impressive depths." – David Warhol, former programmer for Mattel Electronics (on the Intellivision), founder of Realtime Associates, Inc.